General Atomics Aeronautical Systems demonstrated its Predator B/MQ-9 Reaper drone equipped with a Northrop Grumman-built electronic warfare system at a biannual flight training exercise hosted by the U.S. Marine Corps. GA-ASI’s Reaper worked to operate across an electromagnetic spectrum during the USMC Weapons and Tactics Instructor event held Oct. 20 in Yuma, Ariz., GA-ASI said Wednesyday. “Our collaboration with the Marine Corps and Northrop Grumman demonstrates the operational flexibility of the Predator B from being primarily a counter-insurgency aircraft to a platform that can address a broader spectrum of operational requirements,” said Frank Pace, GA-ASI president of aircraft systems. 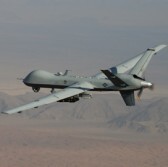 The Reaper is built with Northrop’s Pandora EW technology and remotely-controlled from a GA-ASI ground control terminal. USMC’s flight event sought to evaluate the integrated defense systems of the Reaper, EA-6B Prowlers and other unmanned aerial vehicles.